Greg Grandin’s profoundly insightful and deeply sobering The End of the Myth: From the Frontier to the Border Wall in the Mind of America, initially comes off as a timely update of Richard Slotkin’s colossal trilogy on the history of violence and the frontier myth as critical components of American identity, which concluded with Gunfighter Nation in 1992. Without question, Grandin builds on Slotkin’s study, just as Grandin and Slotkin both draw on (and complicate) the foundational work of Frederick Jackson Turner, whose 1893 essay, “The Significance of the Frontier in American History,” was the first serious effort by a U.S. historian to explore the primacy of frontier expansion and the real and mythical West in the American psyche through the nation’s first century. Like Turner and Slotkin, Grandin considers the meaning of the frontier across the sweep of American history (with both the good and bad fortune to have more recent history to absorb). All three plumb America’s notion of itself as an exceptional nation with limitless possibilities manifested in an inexhaustible adventure of expansion. According to the frontier myth, that persistent push outward created what pragmatist philosopher William James called a “theater for heroism,” and engendered feats of pioneering spirit famously celebrated by James’s protégé Theodore Roosevelt. The frontier also operated as a “safety valve” that promised to put enough distance between opposing factions to defuse (or at least diminish) unresolved conflicts rooted in racism, inequality, and the ongoing battle between collective human rights and (white, male) individual freedom. 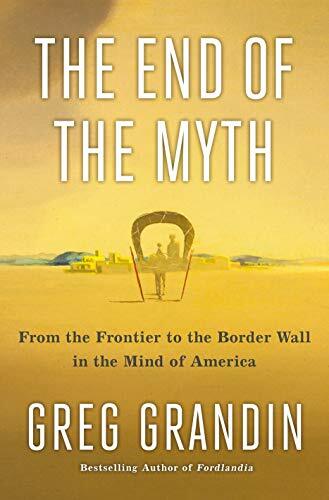 The End of the Myth is the first book to examine the frontier myth from a 21st century perspective—a time when, Grandin argues, the United States has turned inward and backward with the same vehemence it once directed toward expansion and progress. In a country nearly half a century past its thrilling post-war economic peak, still reeling from the economic meltdown of 2008, and mired in pointless and endless Middle East wars, the mythic frontier has given way to a new, and considerably darker rallying point: the border wall. Grandin insists that the purpose of Donald Trump’s preoccupation with the border wall isn’t to build the wall so much as to talk about building it; it’s the idea of a closed border and all the revenge and exclusion it represents, more than the wall itself, that fire the passions of nativist resentment. “For over a century,” Grandin writes, “the frontier served as a powerful symbol of American universalism. It not only conveyed the idea that the country was moving forward but promised that the brutality involved in moving forward would be transformed into something noble. Frontier expansion would break every paradox, reconcile every contradiction between, say, ideals and interests, virtue and ambition. Grandin describes eight prospective wall designs that currently tower over the desert outside San Diego, none of which Homeland Security says will actually be used in a new border wall, even if we build one. These designs, Grandin argues, signify the death of the frontier myth and all the possibilities it once suggested. A number of historians, pundits, and public intellectuals have published recent works that, with varying success, examine Trumpism (or the rapid ascent of the Tea Party a few years earlier) through one historical lens or another, and aim to contextualize its racist nativism, reactionary populism, and subversion of established political norms, while assessing its consequences in real time. In doing so, some of these authors have “looked to history for a usable past”—as Slotkin once described Theodore Roosevelt’s opportunistic approach to American history—in their efforts to advance a working theory on the present moment. Like some of his contemporaries, Grandin reaches devastating conclusions about America’s current trajectory. But there’s nothing polemical or opportunistic about the way he builds his argument, or his original synthesis of two and a half centuries of historical ideas, images, and uses of the frontier in American life, government, rhetoric, and cultural analysis. The End of the Myth is challenging intellectual and cultural history, similar in this respect to Grandin’s earlier book, Kissinger’s Shadow, which presents a penetrating analysis of Henry Kissinger’s geopolitical worldview and its enduring impact on neoconservative American foreign policy. But Grandin’s gift for clear and engaging writing makes The End of the Myth as accessible and enthralling a read as his best-known earlier book, the comparatively plot-driven Fordlandia: The Rise and Fall of Henry Ford's Forgotten Jungle City. Much of the history Grandin incorporates into this new book is utterly captivating in his hands, and often revelatory. What’s perhaps most remarkable about The End of the Myth is the cohesion Grandin achieves in convincingly connecting the disparate strands of history he collects in the book. This makes the gravity of his conclusions on our current predicament all the more unsettling. Here, hope-starved readers will find little of the “we’ve survived worse; this too shall pass” reassurance of, say, Jon Meacham’s The Soul of America: The Battle for Our Better Angels. Are we better than this, as congressman Elijah Cummings and others so often assert in this time of inescapable doubt? Or were we once? As Grandin makes clear, it was never that simple.